Her career in film, on stage and television spanned more than fifty years. It was bookended by D. W. Griffith and Elvis Presley. She played best friend on-screen to more of the top female stars of the golden age of the American studio system than seems possible. 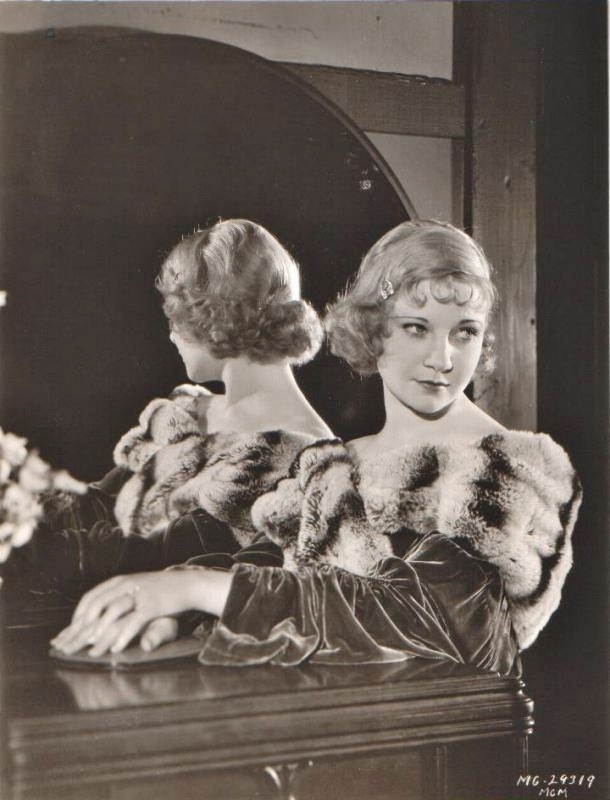 An unconventionally beautiful woman in her own right, Una Merkel may not have been “pretty enough” to rise to stardom as a lead actress among overwhelming competition. But looking at her films, and in particular her production stills and fashion photos, this is hard to fathom. She had looks that would have easily caused a double or triple-take if she walked by on the street. 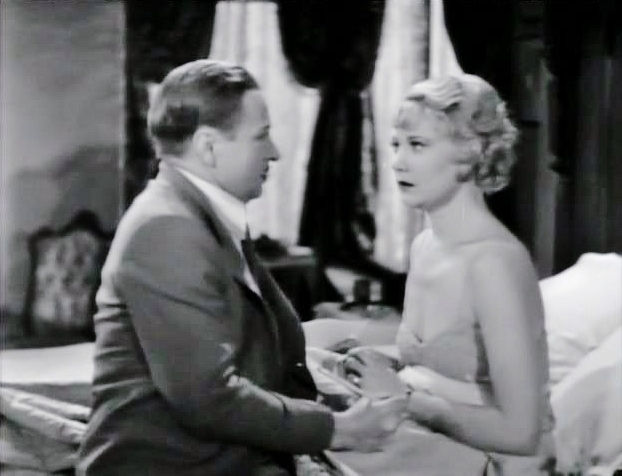 Una Merkel found instead a niche in supporting roles, particularly comedy or often comic-relief in dramas, parts that allowed such a physically attractive woman to play opposite or in support of a major female star without being overly competitive. She used her voice — a Kentucky twang that she could vary (if not completely eliminate) as the role required, along with a face that was as elastic as it was delicately beautiful, to enable her to play a variety of parts, in ensemble or support, and occasionally as the lead in “B” pictures. In the early to mid 1930s, Una Merkel could fairly be called the hardest working woman in Hollywood, appearing in over fifty features in a half-dozen years for Fox, First National, Warner Brothers, RKO, MGM, Columbia, Universal and Paramount. She worked for legendary filmmakers such as Griffith, Ernst Lubitsch, Harold Lloyd, Raoul Walsh and William Wellman. But she is of course best known for her ability to play supporting roles, typically the best friend, advisor and confidant to many of the leading female stars of the period. 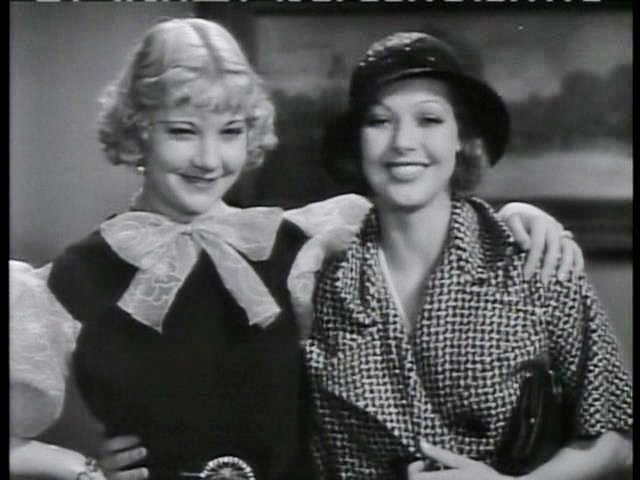 Jeanette MacDonald, Norma Shearer, Jean Harlow, Loretta Young, Irene Dunne, Myrna Loy, Madge Evans, Ann Harding and Carole Lombard all benefitted — some several times — from being able to bounce lines off the Merkel characters who were sassy, sly, knowing, sarcastic, consoling, comforting, cheery, smart or loaded, but never dumb, boring or annoying. 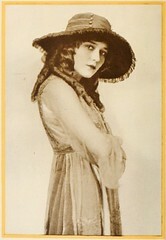 Una Merkel began her film career posing as a stand-in for Lillian Gish in Way Down East (1920). Undoubtedly, her general resemblance to Gish got her hired, but the fact that she was a native of Griffith’s Kentucky certainly didn’t hurt. (Some sources cite that she did the same for Griffith’s The White Rose (1923) and Gish’s classic The Wind (1928) for Victor Seastrom and MGM.) 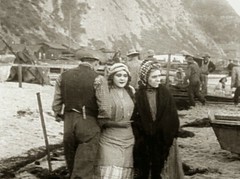 Griffith later gave her the first important role she had in the movies, as Ann Rutledge in his penultimate film, Abraham Lincoln (1930). But Merkel spent more time in the Twenties in the footlights than she did in front of the camera. 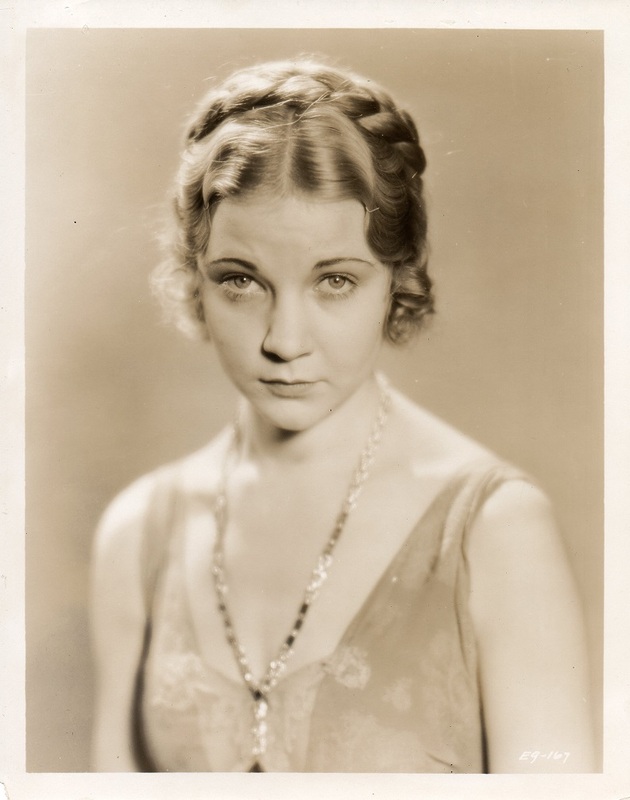 Her early stage career peaked with a principal role in Coquette (1927-28) starring Helen Hayes which ran for nine months and over 300 performances on Broadway. 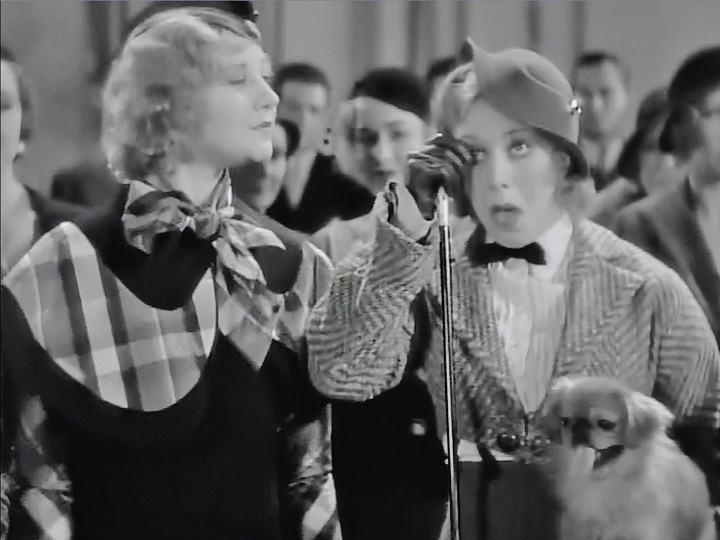 After her lead in “Lincoln,” Merkel settled into a series of ensemble roles — more than “support,” but less than a featured “leading lady.” In The Bat Whispers (Schenck-UA, 1930, dir. Roland West), the second film version of Daddy Long Legs (Fox, 1931, Alfred Santell) and the first Maltese Falcon (Warner Brothers, 1931, Roy Del Ruth), she stood out as an ensemble player, making one wish for her to be cast in a starring role in an “A” picture. But signing a contract with star-laden MGM in 1932 virtually guaranteed this would never happen. 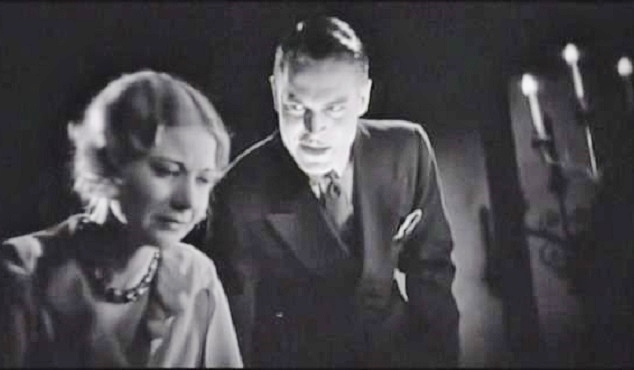 Una Merkel with Chester Morris in The Bat Whispers (Schenck-UA, 1930, dir. Roland West). 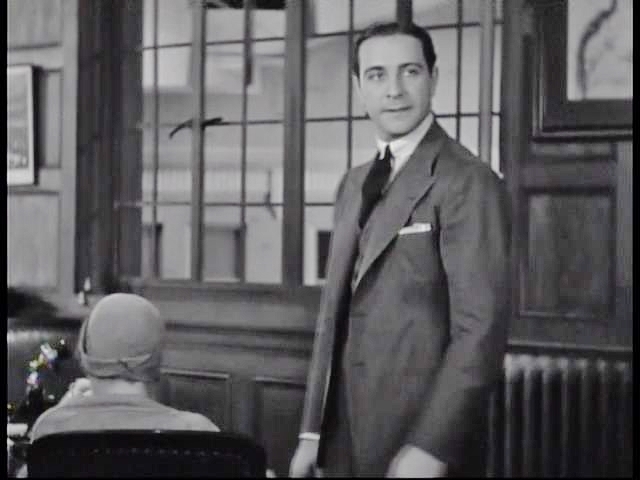 Above, Ricardo Cortez is the original film private eye, “Sam Spade,” in the first version of The Maltese Falcon (WB, 1931, dir. Roy Del Ruth). 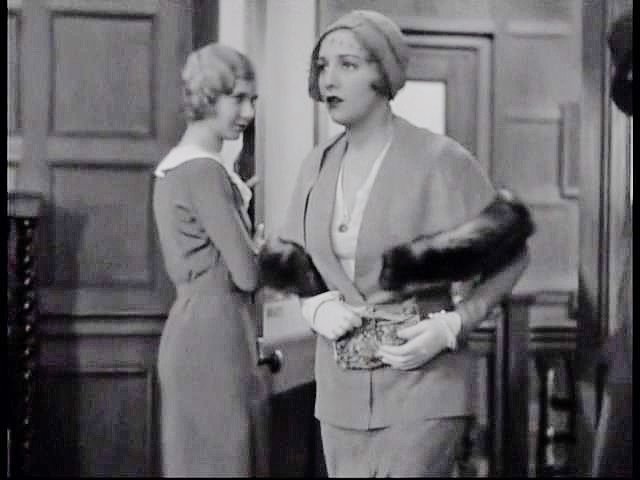 As he flirts with his secretary, Effie (Una Merkel), a new client (Bebe Daniels), Below, comes calling, in need of his detective services, much to Effie’s amusement. With MGM, Merkel continued a pattern of ensemble roles, such as Noel Coward’s Private Lives (1932) starring Norma Shearer, leads in “B” pictures such as Whistling in the Dark (1933) with Ernest Truex and two of her best “BFF” roles in Red-Headed Woman (1932) with Jean Harlow, and Midnight Mary (1933) with Loretta Young. The latter two films are arguably the best performances of their kind for Merkel, and show her versatility even within the limits of this role-type. In Red-Headed Woman, she is paired opposite a red-and-white-hot Jean Harlow at her most incendiary — Merkel’s Sally is the sensible “gal-pal” who almost lives vicariously through her wild girlfriend’s adulterous, sexual exploits. 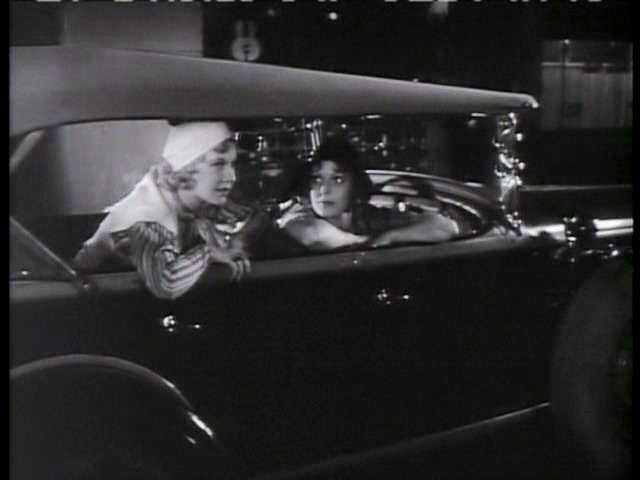 In Midnight Mary, she is Bunny, the funny girl who gets her gorgeous but criminally inclined friend into trouble with the law, then gets herself “in trouble” with a pregnancy out-of-wedlock that inadvertently leads to Mary’s act of murder. 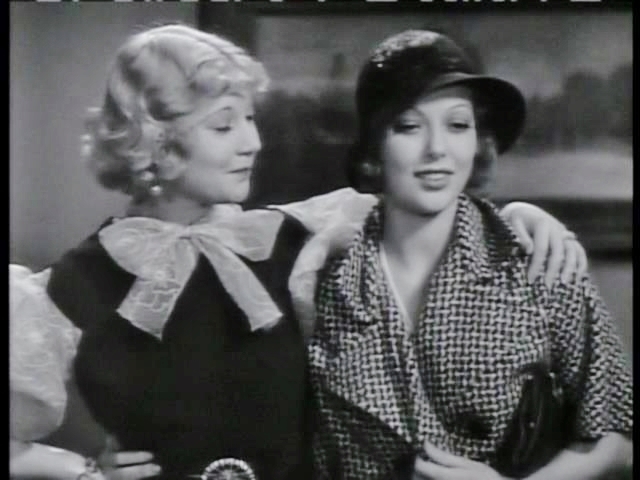 Above, in Red-Headed Woman (MGM, 1932), Una Merkel’s Sally comes home to find her roommate, Red (Jean Harlow) drunk and wallowing in self-pity after being rejected by her married lover, Bill. Below, unwilling to listen to Sally’s advice, she tosses Sally aside and bolts out the door to confront Bill. 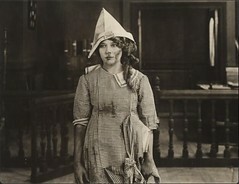 In Midnight Mary, Merkel and star Loretta Young play a couple of junkyard urchins, circa 1919, who grow up too soon, and become “accessories” to prohibition-era gangsters. 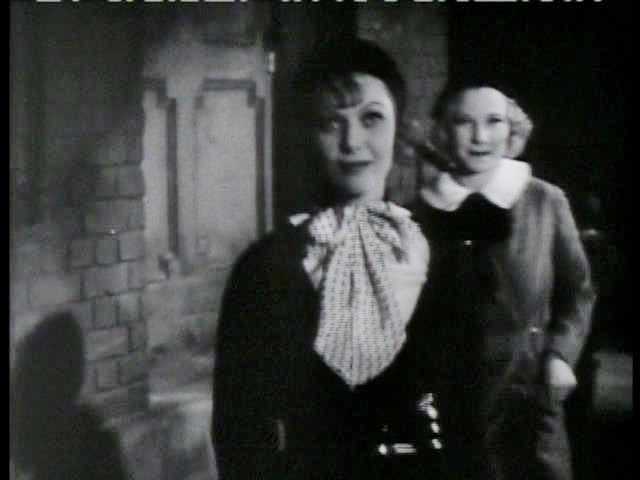 Below, as a lead in a “B” picture, Whistling in the Dark (MGM, 1933, dir. 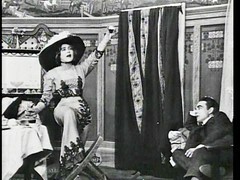 Elliott Nugent), Merkel with co-star Ernest Truex (who twenty years earlier had played opposite Mary Pickford onstage in David Belasco’s A Good Little Devil). 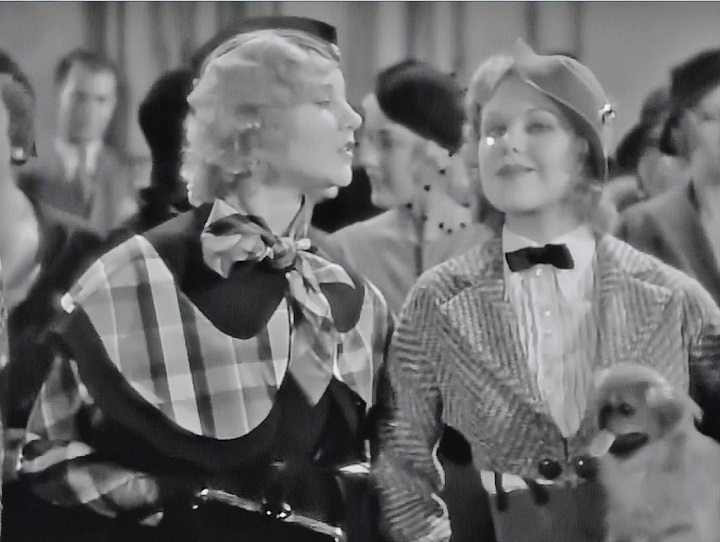 Below, with Ginger Rogers, both in supporting roles in 42nd Street (WB, 1933, dir. Lloyd Bacon), the high-water mark of the backstage musical (Rogers’ breakout film with Fred Astaire, Flying Down to Rio, had not yet been released). 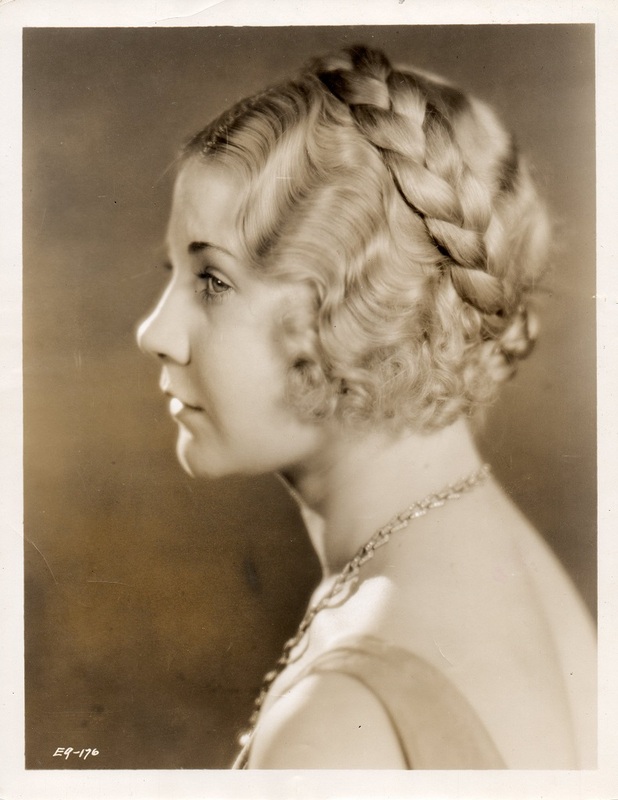 Una Merkel left MGM after her contract expired in 1937. She worked regularly, but far less frequently than she had early in her career. A series of personal setbacks in the late forties (divorce from her only husband, the suicide of her mother), combined with the retrenchment of the film industry with the rise of television, and the persistence of age discrimination endemic to Hollywood, slowed her film career. She appeared occasionally in film and in series television and returned to the stage in the mid 50s. But Merkel still had her share of late-career triumphs: a Tony nomination in 1956 for The Ponder Heart, and an Academy Award nomination for Best Supporting Actress in 1961 for Summer and Smoke, capped a lifetime in the performing arts. 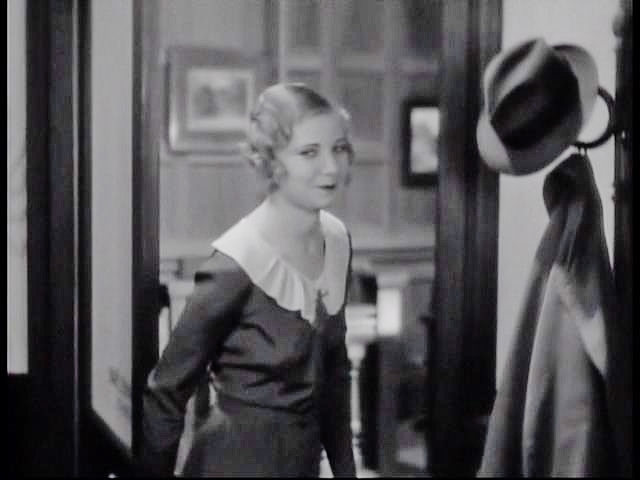 As in my brief pictorial sketch of Mary Fuller, I haven’t attempted a real bio of Una Merkel. If you are interested in learning more about her, a good biographical sketch by film historian Cliff Aliperti can be found here. A spare overview can also be had from Wikipedia. 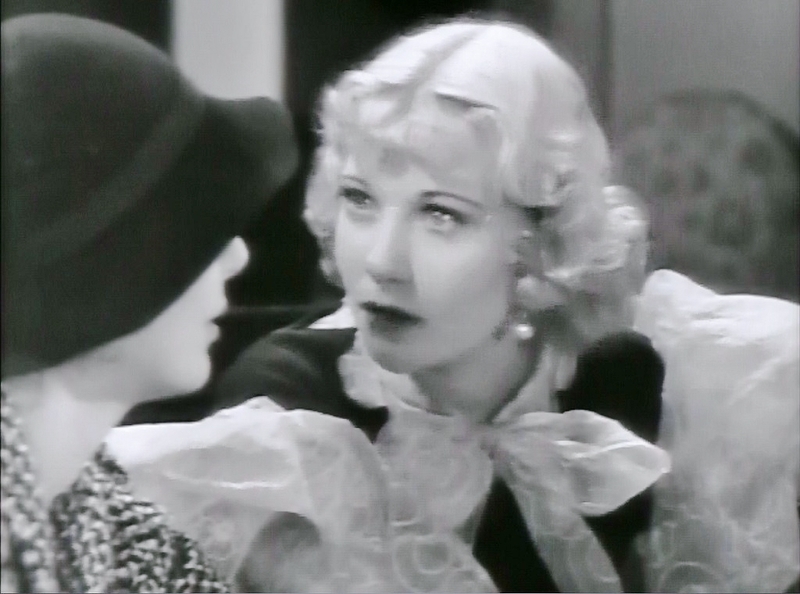 It is regrettable that Una Merkel did not write her memoirs or, as some have done, leave her papers to an institutional archive for future historians to study. Not being a major star, this was probably something she never considered, downplaying her own importance to the history of film during the peak years of the American, “Hollywood” studio system. 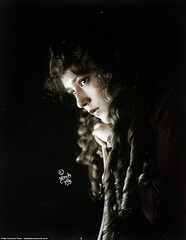 Though not a star, she was present at many important moments and worked with so many other important figures in cinema. What stories could she tell us of working with Jean Harlow, both early and late in the career of the Blonde Bombshell — what did she feel when during the making of Saratoga in 1937, she and her co-workers learned of Harlow’s death? It makes those of us who care strive to work that much harder to dig deeper to find and understand the people who are the history of motion pictures and the performing arts.